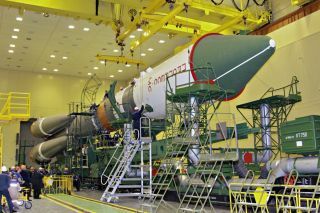 Russia's Progress 69 resupply rocket is pictured in its processing facility at the Baikonur Cosmodrome in Kazakhstan. Update for Feb. 11: The launch of the Soyuz 2.1a rocket carrying the Progress 69 cargo ship was aborted at the last minute early today due to an unspecified issue. The next launch attempt could take place on Tuesday (Feb. 13). A Russian Soyuz rocket will launch a cargo shipment to the International Space Station (ISS) in record time early Sunday morning (Feb. 11), and you can watch the event live online. Topped with the Russian Progress 69 cargo resupply ship, the Soyuz will lift off from the Baikonur Cosmodrome in Kazakhstan at 3:58 a.m. EST (0858 GMT). The Progress spacecraft will then dock at the International Space Station at 7:24 a.m. EST (1224 GMT), completing the rendezvous in a record time of 3 hours and 26 minutes. A live webcast of the launch will begin at 3:30 a.m. EST (0830 GMT), and you can watch it here on Space.com, courtesy of NASA TV. A live webcast of the spacecraft's docking will follow at 6:30 a.m. EST (1130 GMT). Russia's space agency, Roscosmos, planned to debut this new fast-track route to the ISS with its last cargo launch of the Progress 68 spacecraft, in October. But a last-minute delay forced the agency to resort to the old two-day rendezvous due to the orbital mechanics involved with reaching the ISS. Postponing that launch meant that Roscosmos missed the launch window to try out the new, shorter rendezvous, NASA officials said. "If any technical issues are identified by Russian flight controllers in the early stage of the flight, the spacecraft will be capable of defaulting to a standard, two-day rendezvous profile," NASA officials said in a statement. The Progress 68 cargo craft (top left) is currently docked at the International Space Station. It arrived on Oct. 16, 2017, and is scheduled to depart in March. Progress cargo ships look a lot like Russia's crewed Soyuz capsules, and Roscosmos has been using the uncrewed spacecraft to send cargo to the ISS since 2000. In 2013, the agency cut the two-day travel time to just 6 hours for both Progress and Soyuz capsules, making the cramped crewed flights to the ISS a little more bearable for the astronauts and cosmonauts on board. This uncrewed cargo mission will deliver 3 tons of food, fuel and other supplies to the Expedition 54 crew, NASA officials said. The record-breaking flight comes just one week after the two Russian crewmembers at the ISS, Alexander Misurkin and Anton Shkaplerov, set a record for the longest Russian spacewalk.